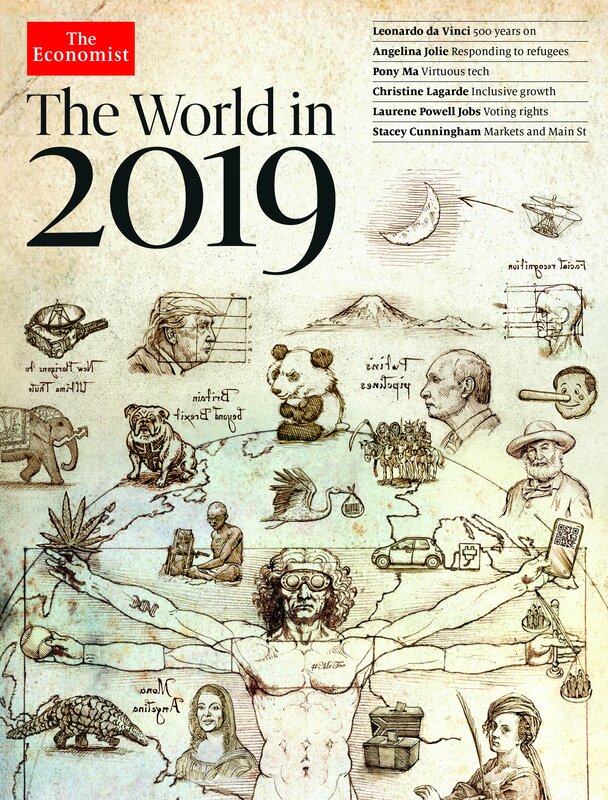 A look at the cryptic symbolism found on the cover of the Economist’s “The World in 2019” which includes the Four Horsemen of the Apocalypse. What are they trying to tell us? Every December, the reputed magazine The Economist publishes a special edition that predicts the trends and the events of the year to come. And every time, the cover of these editions is an elaborate collection of images referring to various people and concepts. While the meaning of some of these images is obvious, others appear to be coded for “those in the know”. This year’s edition is no exception. In fact, it is more cryptic than ever. Why would anybody spend time deciphering these covers? Because The Economist isn’t just any publication – it is directly connected with the world’s elite. It is partly owned by the Rothschild banking family of England and its editor-in-chief, John Micklethwait, has attended the Bilderberg Conference several times. In short, the leadership at The Economisthas inside knowledge of the elite’s agenda, and they do their best to promote it. 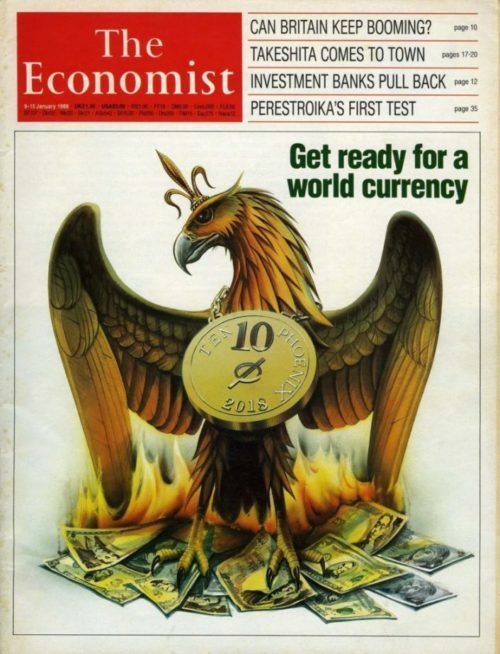 This 1988 cover of The Economist called for the creation of a world currency called the Phoenix – one of the occult elite’s favorite symbols. The bird stands on a pile of burning national currencies. As seen in my articles about the 2015 and 2017 editions of The Economist, these covers are often replete with occult elite symbolism, mixed with subtle messages about the many ways the elite controls the masses. The 2019 edition is more blatant than ever. Note that the description emphasized the fact “this will be the 33rd edition”. Why emphasize this random numerological this fact? Is it because 33 is the most important number in Freemasonry? That would make sense because the cover features intense Masonic symbolism through the works of Leonardo da Vinci. The main theme of this cover is Leonardo da Vinci because 2019 will mark the 500th anniversary of his death. 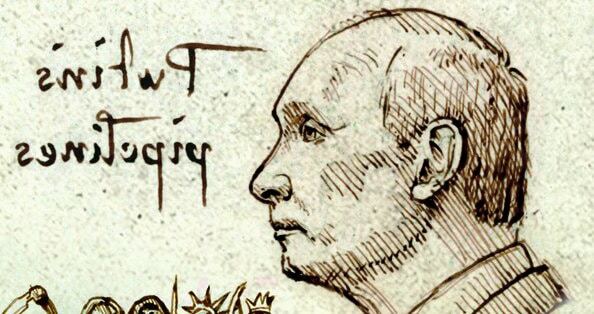 As such, the art style is made to look like a da Vinci manuscript. The first detail that one might notice is the mirror writing. Why is everything written backward? Well, da Vinci often wrote in mirror writing and the reason he did that remains a mystery. Some claim that he did not want to smudge ink while he was writing; others believe that he did not want other people to steal his ideas. Those who have researched Vinci’s occult leanings believe that his backward writing might have something to do with him attempting to conceal esoteric knowledge. In his day, those who accused da Vinci of being a heretic even called his mirror script “writings of the devil”. In occult circles, mirror writing is often associated with Satanism and black magic, based on the reversal of symbols. Let’s look at the symbolism of the cover. At the center of the cover is the Vitruvian Man, da Vinci’s famous sketch depicting a man stretched out inside a circle and a square. It is said to be a representation of “the perfect man”. The original Vitruvian Man with da Vinci’s comments in mirror-writing. While the Vitruvian Man is often described as a “study of human proportions”, it bears a much deeper symbolic meaning in occult circles – especially in Freemasonry. It esoterically represents the human body (the microcosm) as a reflection of the entire universe (the macrocosm) – a hermetic principle summed up by the saying “As Above, So Below”. Da Vinci’s sketch was based on the works of Vitruvius, a Roman architect who was considered to be the “First Grand Master” of Freemasonry. Appropriately enough, the Vitruvian Man visually depicts the ultimate goal of Freemasonry: Squaring the circle. In Masonic symbolism, the square represents the physical body and the circle represents the soul. On a wider scale, the square represents the material world, while the circle represents the spiritual realm. One of the goals of Freemasonry is to harmonize these two opposite worlds (physical and spiritual) to create the “perfect man”. This concept is fully represented in the logo of Freemasonry. The Masonic square and compass. 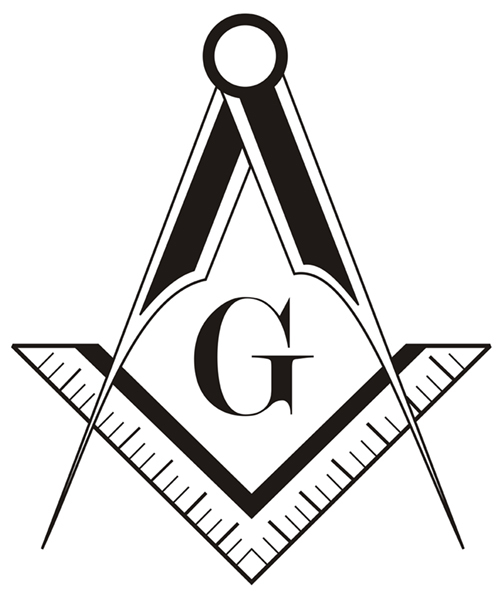 The logo of Freemasonry combines a square and a compass – two tools used in architecture. The square is used to draw squares while the compass is used to draw circles. By “squaring the circle”, the Freemason is said to achieve godhood. I won’t go deeper in the connections between da Vinci and occultism because that would require an entire book (and I’m not talking about The da Vinci Code). 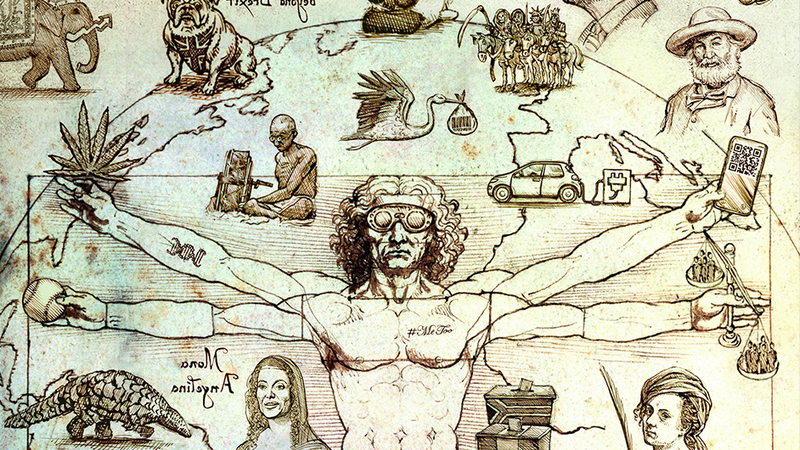 Let’s just remember that, for its 33rd end-of-year edition, The Economist features a “modern” Vitruvian Man. The 2019 Vitruvian Man wears night-vision goggles, or maybe a VR headset. Is his sight being improved or is he being blinded? In his hands, he holds a leaf of cannabis, a baseball, and a smartphone. One could argue that all of these things are used to distract and pacify the modern man through drug companies, big tech, and entertainment. The Vitruvian Man also has two tattoos. On his forearm is a double-helix, the symbol representing DNA. This is most likely a reference to the intense research in DNA modification happening in the private sector. 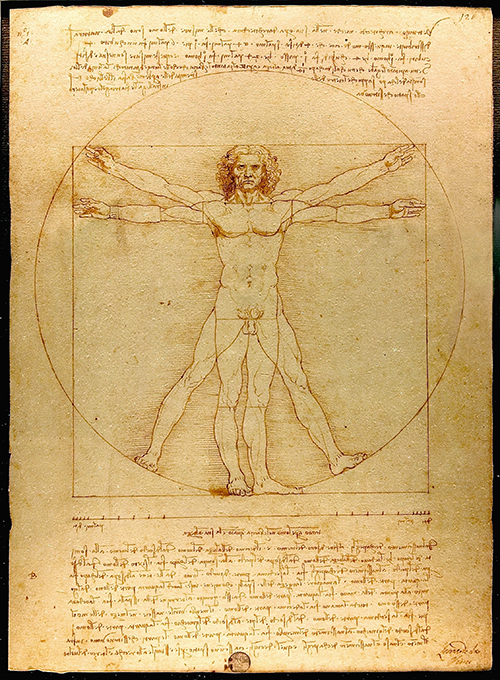 Was the Vitruvian Man’s DNA altered? Across his heart is tattooed “#MeToo”. While the #metoo movement did expose some Hollywood creeps, it also has created a climate of censorship and repression where many people have accused, judged, and sentenced to expulsion in the public sphere. On a somewhat related note, the Vitruvian Man holds a scale – a classic symbol representing justice. However, the scale is heavily slanted on the side that has 5 people versus 4. Is this the U.S. Supreme Court, who recently gained a new and controversial judge, or is this just the tilted scales of justice in 2019? Overall, the modern Vitruvian Man appears to be blinded, weakened, distracted, and repressed. The circle around him that once symbolized the spiritual realm is now the Earth. Did the Vitruvian Man lose his soul? Is he now concerned only with Earthly matters? 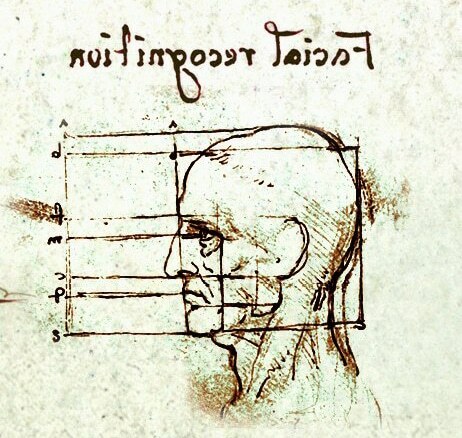 The cover features an exact replica of da Vinci’s sketch analyzing the proportions of the human head. Above the image is written (in reverse) “Facial recognition”, which the next step in Big Brother surveillance technology. A headline from The Guardian about Taylor Swift scanning the faces of her fans without notice or consent. 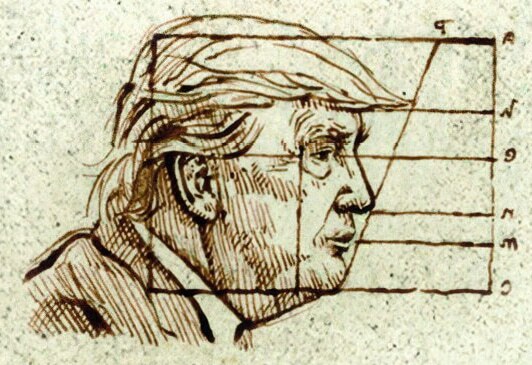 The Economist cover also analyses the proportions of Donald Trump’s head. The lines on Trump’s head are different from those above. Do you notice the outline of an upside down American flag? The other head of state featured on the cover is Vladimir Putin with the words “Putin’s pipelines”. This is a reference to the natural gas pipelines that are being built by Russia, in Syria, the Post-Soviet States, and even Europe. NordStream 2, a natural gas pipeline linking Russia to Germany, is set to be completed in 2019. This highly controversial project was deemed to be “act of betrayal” from Germany as critics say it will leave Europe at the mercy of Russian energy. TurkStream, a Russia-Turkey pipeline, was launched in November of 2018 and will help consolidate Russia’s economy and regional influence. 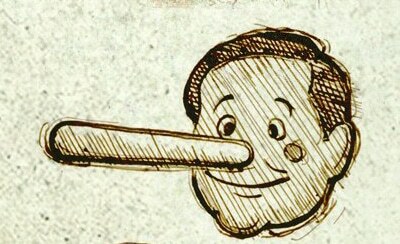 Right behind Putin is Pinnochio – a puppet whose nose grows after telling a lie (Fun fact: The tale of Pinocchio is also a profound Masonic allegory). So the cover implies that someone will lie in 2019. But who? Trump and Putin (the only two politicians on the cover)? The elite in general? Kanye West? No clear answer. It’s just The Economist telling the masses that they are being lied to in general. Thanks, guys. 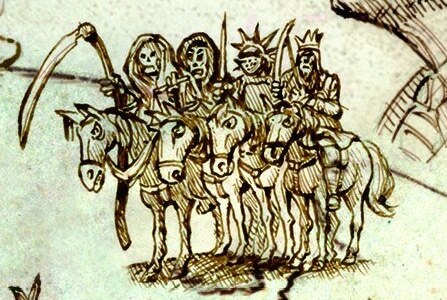 Right under Putin, standing on Northern Europe and facing America, are none other than the Four Horsemen of the Apocalypse. The Book of Revelation describes the Horseman as harbingers of the Last Judgement. The White Horse is said to symbolize Conquest, Pestilence and the coming of the Anti-Christ; The Red Horse represents War; the Black Horse is associated with Famine, and the Pale Horse brings Death. That’s some heavy-handed catastrophe-predicting stuff. Why did The Economist add this extremely ominous Biblical figure on its cover? There is no clear explanation. This one can be interpreted in a few ways, and all of them are upsetting. 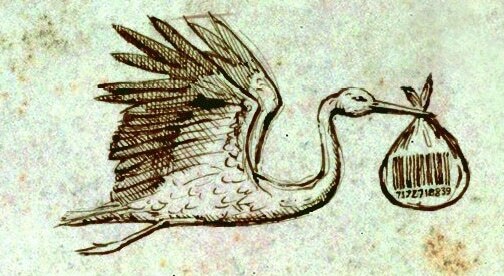 It is a classic depiction of a stork carrying a newborn baby. However, there’s one important detail: There’s a barcode on the bag carrying a baby. This might be a reference to “designer babies”, a controversial practice that should gain momentum in 2019. A designer baby is a human embryo which has been genetically modified, usually following guidelines set by the parent or scientist, to produce desirable traits. This is done using various methods, such as germline engineering or preimplantation genetic diagnosis (PGD). This technology is the subject of ethical debate, bringing up the concept of genetically modified “superhumans” to interbreed with and eventually replace modern humans. The second meaning of this image could be child trafficking. Barcodes are placed on products to track inventory and to complete transactions. Child trafficking is about treating human as products to be sold. It’s a pretty effective (and disturbing) way of symbolizing child trafficking. Finally, considering the fact that the stork is right under the Four Horsemen of the Apocalypse, this image could also have a biblical meaning. The Book of Revelation states that, after the rapture, people on Earth would be forced to receive the “mark of the Beast” (666) in order to “buy or to sell”. What better way to force a person to receive the mark of the Beast than by applying it at birth? The cover contains several other images referring to events The Economist is predicting to come in 2019. Here’s a quick rundown. At the top of the cover, an arrow points from da Vinci’s flying machine towards the moon. This might be a reference to the many private companies aiming to travel to the moon in 2019. It should also be noted that we’re seeing the crescent moon on the cover, the main symbol associated with Islam. There’s another “flying machine” (a real one) under the words “New Horizons of Ultimate Thule”. This refers to NASA’s New Horizons spacecraft getting close to the mysterious, distant object Ultima Thule on New Year’s Day. Under the moon is a volcano. Are we expecting another volcano to be erupting soon? At the bottom left (standing on Brazil) is a pangolin, which is the trafficked mammal on earth. It is under the threat of extinction. 2019 will be the 150th anniversary of Gandhi’s birth; It is also the 200th anniversary of Walt Whitman’s birth (shown under Pinnochio). Angelina Jolie is the face of Mona Lisa – da Vinci’s masterpiece. At the top of the cover we see “Angelina Jolie: Responding to Refugees”. She might be used to promote the UN’s new “Migration Pact”. Indeed, Jolie is currently the Special Envoy for UNHCR, the UN Refugee Agency. She focuses on “major crises that result in mass population displacements, undertaking advocacy and representing UNHCR and the High Commissioner at the diplomatic level”. The cover of “The World in 2019” is an apt reflection of the occult elite. It mixes occult symbolism with references to the control and manipulation of the masses. It also takes a bizarre pleasure at predicting catastrophic events while keeping people guessing with vague and unexplained references. The elite likes to withhold information and reverse writing emphasizes this fact. At the center of it all is the Vitruvian Man, a symbol used by the Masons to represent a human reaching full potential. However, the 2019 version is blinded and distracted by things pushed by the elite. Will we allow ourselves to follow the bleak path that they predict?